A great emphasis is put on the design of each Green Traiteur & Café, in order to have every store harmoniously integrated into specific neighbourhoods. The Green Traiteur & Café spirit is always there, but we are far from those chains repeating the same decor over and over. 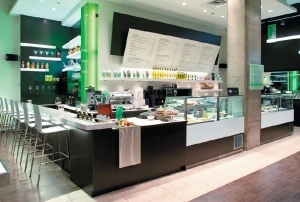 Our Green Traiteur & Café are known for the fresh and modern ambiance that they offer. Warm and vivid colors, marble, stones and wood elements are perfectly combined to create an atmosphere that invites customers to relax, breathe, eat, and drink. Our client can enjoy themselves in our lounge sections while they read the magazines and newspapers available for them. When space permits, we like to add a long table for strangers or peers to share. Our goal is to create a place where everyone feels comfortable and welcomed. Merchandising displays highlight our great retail products and exclusive coffee beans bags. 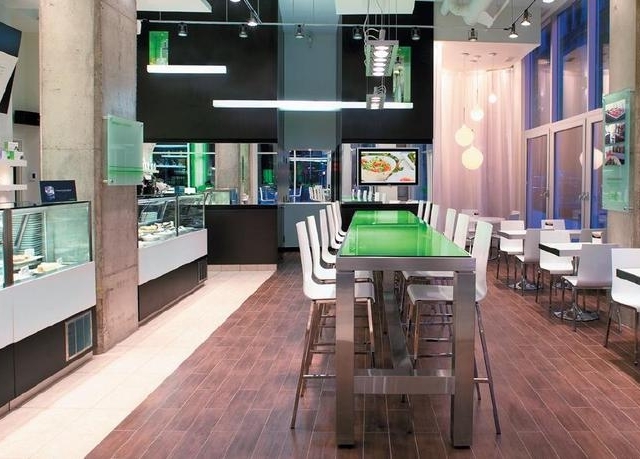 Green Traiteur & Café design accents that we love! The Espresso machine and its two grinders. The flamboyant wallpapers that we love but would not dare install in our own nest! The tall windows and ceiling.